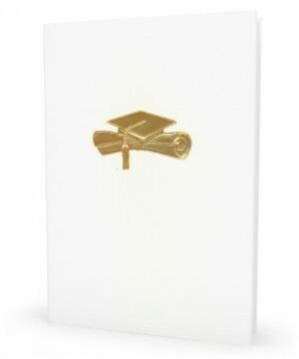 Whether graduating from high school or college, this personalized memory book is sure to keep everyone laughing out loud for years to come while becoming a permanent record of your graduate’s educational journey and the people who there to guide and support him/her: family members, friends, teachers, and professors. Your unique approach to the educational system will be laid out for all to see: awards for unusual attendance, creative assignment completion and your imaginative excuses. In the long, complicated unfolding of human history, there are a few events that stand out as incidents of world-shaping dimension: the discovery of the Americas, those first footsteps on the moon and the invention of the zipper. Alongside these momentous events, we must now place the graduation of Mike Smith. Mike, there were those who said you couldn't do it. There were those who doubted your tenacity. There were those who thought you would never make it. There were those who said that Mr. Jones, Mrs. Sebastian, Miss Kelley and Mr. Wright and the other teachers at Florida State University were wasting their time. But, what do those people know anyway? You earned your BS somehow. It doesn't seem that long ago that you began to attend Florida State University, does it Mike? Well, all right. It does seem like a long time ago. Anyway, you knew from the beginning that there would be challenges. And you knew that some of those challenges would be quite enjoyable, others would be exhilarating, but did you have to make every one insurmountable? And what about the challenges that friends like Karen and Alicia faced dealing with you on a daily basis. . . .
- Bold words above will be replaced with your personalized information. Alongside these momentous events, we must now place the graduation of David Bradford Hefty. David, there were those who said you couldn't do it. There were those who doubted your tenacity. There were those who thought you would never make it. There were those who said that Mr. Pallentino, Mrs. Garret, Miss Temple and Mr. Holt and the other teachers at Gulf Breeze High School were wasting their time. But, what do those people know anyway? You earned your diploma somehow. It doesn't seem that long ago that you began to attend Gulf Breeze High School, does it David? Well, all right. It does seem like a long time ago. Anyway, you knew from the beginning that there would be challenges. And you knew that some of those challenges would be quite enjoyable, others would be exhilarating, but did you have to make every one insurmountable? And what about the challenges friends like Karen and Alicia faced dealing with you on a daily basis? This is a quality hard-cover personalized memory book. Clear pages are included for photos, gift cards, etc. Made with durable wipe-clean hard covers.